One of the more recent fad diets has been gluten free. To be clear I am not talking about people who have celiac disease, they are not choosing to be gluten free, it is a necessity for them. I want to know if it is any healthier for people to choose to be gluten free than to eat normally. Gluten is a substance present mostly in wheat products, that gives them there elastic texture. Essentially it is like the glue that holds wheat products together. As you might have guessed from that definition, it can be incredibly hard to cut out gluten entirely. This is simply because of the vast number of foods that contain gluten, all bread products, pasta, pizza and some cereals are just some of the foods that contain gluten. Additionally, drinks such as beer also contain gluten. Going gluten free requires a huge amount of effort, you essentially have to plan all your meals ahead of time because nearly every meal will require some kind of altering in order to cut out the gluten. This means buying specific, and in many cases more expensive, groceries, learning how to cook gluten free meals, and constantly watching what you eat at restaurants and social gatherings. Especially the latter as party hosts usually wont prepare a gluten free option. So is all this effort worth it? Is going gluten free more healthy than a normal diet? The answer is a resounding no. The consensus in the medical field is that going gluten free has no benefit to your health. Dr. Daniel A. Leffler, director of clinical research at the Celiac Center at Beth Israel Deaconess Medical Center in Boston, says it quite well when he states that people who are not medicaly required to, will derive “no significant benefit” from going gluten free. He goes on to say that people who choose to be gluten free will “waste their money” because gluten free products are expensive and they are getting no benefit from it. This article from the Harvard Medical School sums it up quite well and even says that going gluten free can be harmful because it deprives people of B vitamins, which are typically gained from bread. The bottom line here is that choosing to be gluten free is a horrible decision, not only is it not healthier than a normal diet, but is can actually harm you by depriving you of necessary vitamins. So keep eating bread, because you need gluten. This post was very unique because this is not the type of topic that people frequently write on. It was good to see this because I often hear of people going gluten free by choice in hopes of losing weight, when in fact this deprives the body. My mom was diagnosed with celiac almost ten years ago now, and i know she takes a lot of supplements because of it. I would like to see if a longitudinal study that followed a specific demographic, one who eats gluten and one who doesn’t, and see if any notable health trends can be discerned. 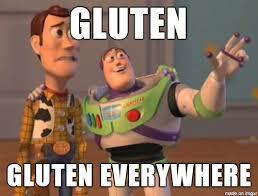 I have recently been told by my doctor that I should try going gluten free for little due to stomach issues. When he told me this I was extremely upset because I live off of pasta, bagels, and everything containing gluten. To make myself feel better I told myself that going gluten free will help you lose weight and be healthier, but now I know thats not the case so thank you! I am also a vegetarian so being a vegetarian and gluten free at college is extremely hard! For people who do not need to be gluten free I do not recommend it. You can be healthy, skinny, and lose weight without being gluten free! Here is an article on what happens when you go gluten free and what I am going through now!